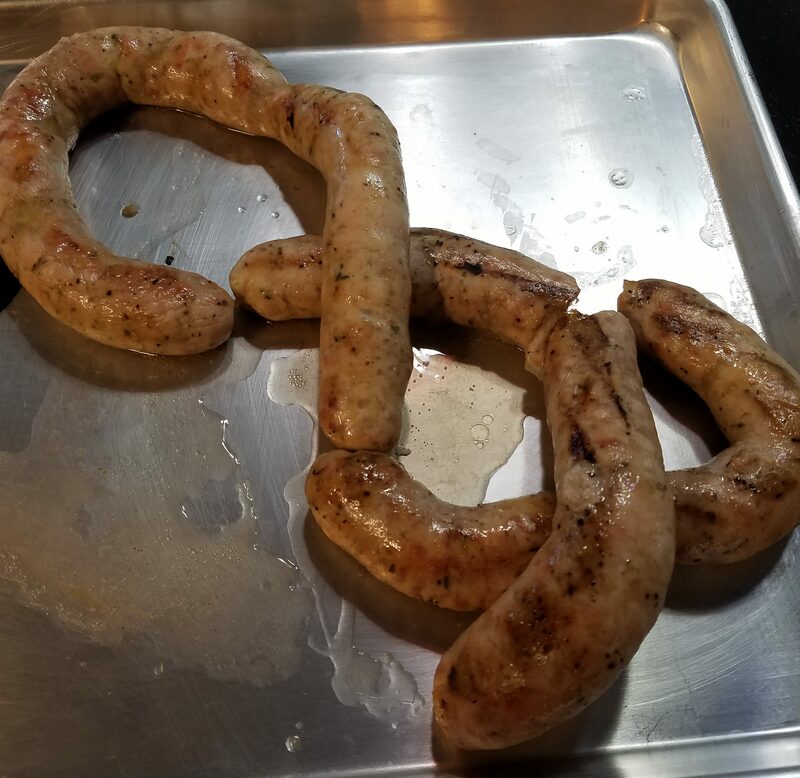 The sausage maker strikes again. This time with a smaller load of chicken thighs. 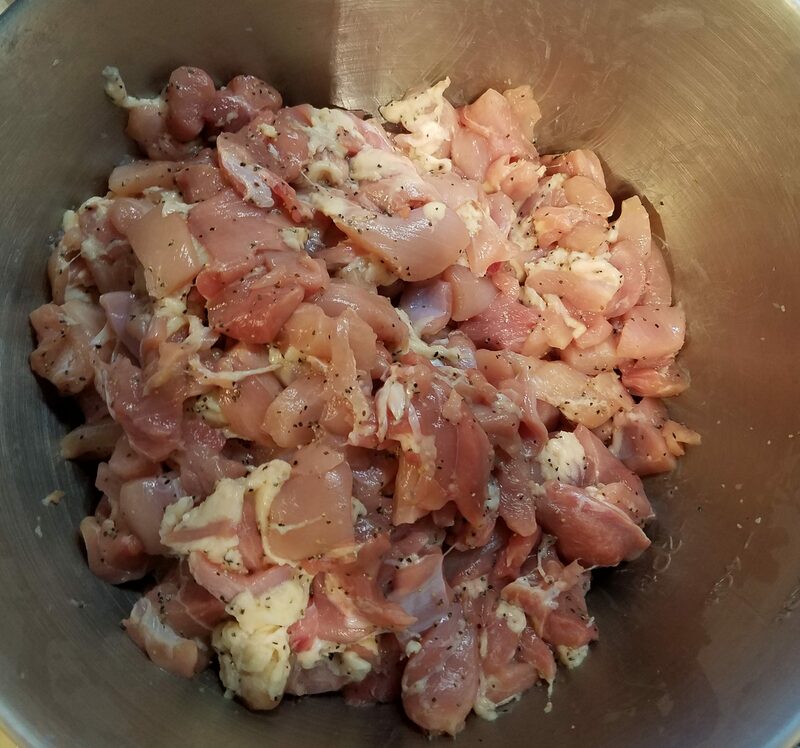 I started with only 5 pounds of chicken thighs instead of 10+ pounds of meat like last time. The pieces were chopped up smaller this time, and I didn’t add any pork fat. This was just simple chicken, salt, pepper, and a little fresh rosemary from the garden. Last time I was doing a lot of meat shoveling and stuffing, and ended up having to employ my lovely wife to help. I didn’t get many pictures as a result. This time my maker mom was in town. I figured out how to guide with one hand while I pressed with the other. Mom filled the hopper and took pictures. I don’t know if it was the consistency difference, the smaller hunk size or what, but this batch went really smoothly. My diameter consistency needs help still, but I am improving. 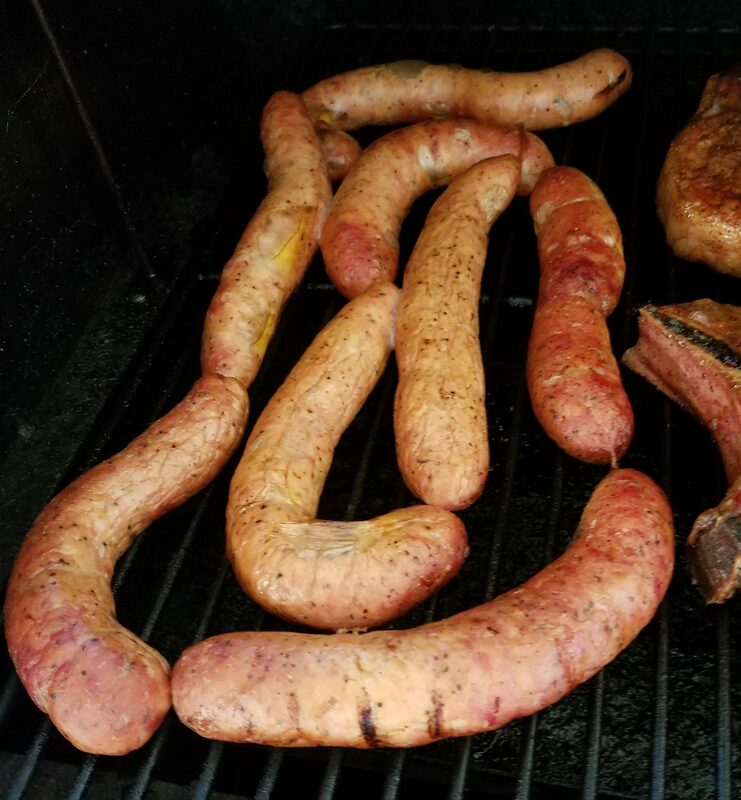 When all was said and done, we had two piles of lumpy but delicious looking sausage. The batch with rosemary got grilled for dinner the same night as it was made. I don’t know if it should sit in the fridge a few nights for the flavors to meld or not, but this worked well. It was pretty tender and moist enough. Not as much as the brats were, but the fat content of this was a lot lower. A very delicious and cheap chicken sausage for the grill. The second batch got smoked a few days later. It was also quite delicious. I am glad I didn’t use any white meat, the sausage was good, but could probably easily be dry if it were any leaner. 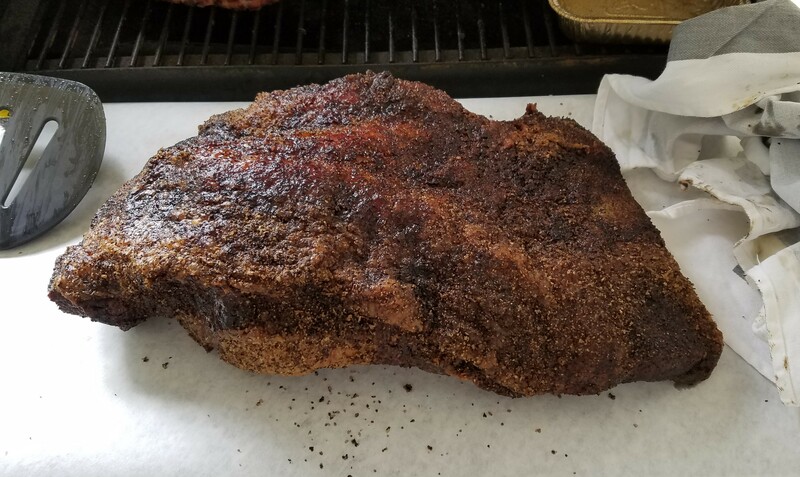 Since my smoker renovation back in January I have been working to re-learn the process. The new controller holds everything at different temperatures than I am used to. Time to experiment! 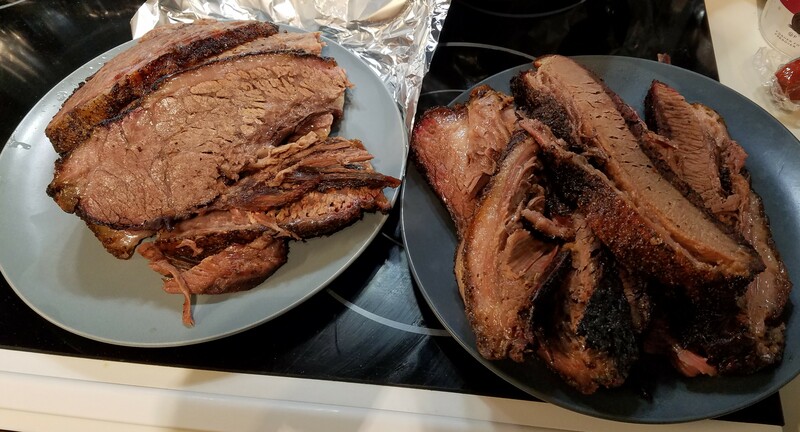 I had a lot of family over on Easter, and decided to skip the ham and go for an Easter brisket! This badboy started off at 2am weighing in at over 13 pounds! A lot of trimming later he was ready for some coarse salt and pepper rub down. Off the little brisket goes to smoker school to learn to be tender and dark and delicious. 5 hours later I woke up and did a check. It was really far along. I started off with the setting of 275, but I know that the smoker runs a little colder in the center than the built in probe reads. Maybe using oak changed the setting. I lowered the temp to 225 and let it go for another 4 hours. Our little brisket has graduated with a bachelors degree in deliciousness. Some post graduate school would do it well. All wrapped up in butcher paper it continued its studies in a cooler. Resting in a cooler is great, all the insulation keeps it hot for hours. We ate nearly 3 hours later, and it was still piping hot. 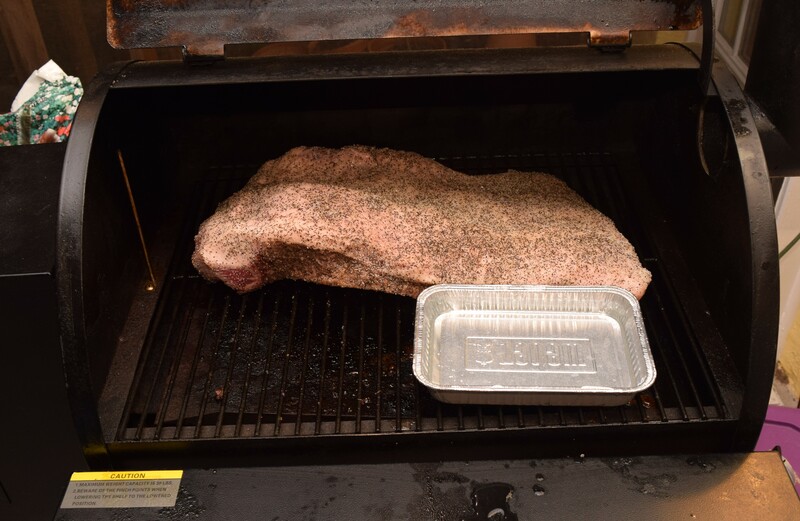 The bottom 1/8 to 1/4″ of the brisket was a little dry and hard, but the rest was pretty good. I am guessing this was due to the heat being too high at the outset. The fat was well rendered and melted in your mouth. 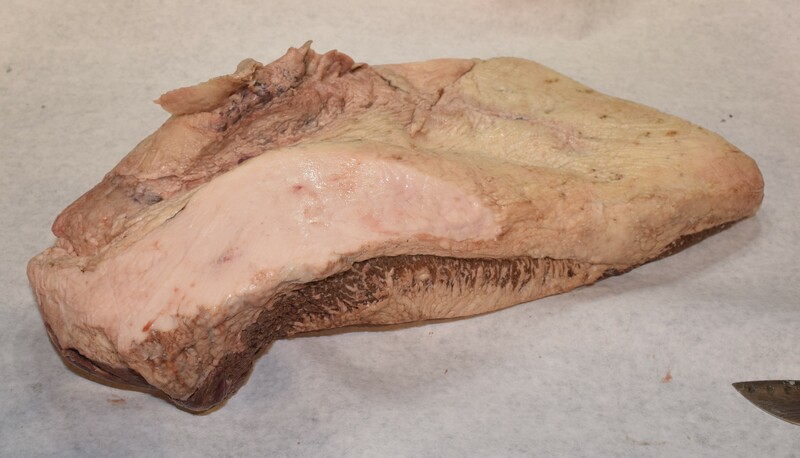 Over all it is a really tasty brisket, but there is always room for improvement. Next time, I will start at 250 and see how things run. I couldn’t completely buck tradition. Sometimes you just really want ham for Easter. I stuck a little half ham in the smoker for the last few hours to warm it up and impart a little smoke. Oak and ham aren’t a perfect match, but it turned out well nonetheless. My beloved smoker has fallen on hard times. 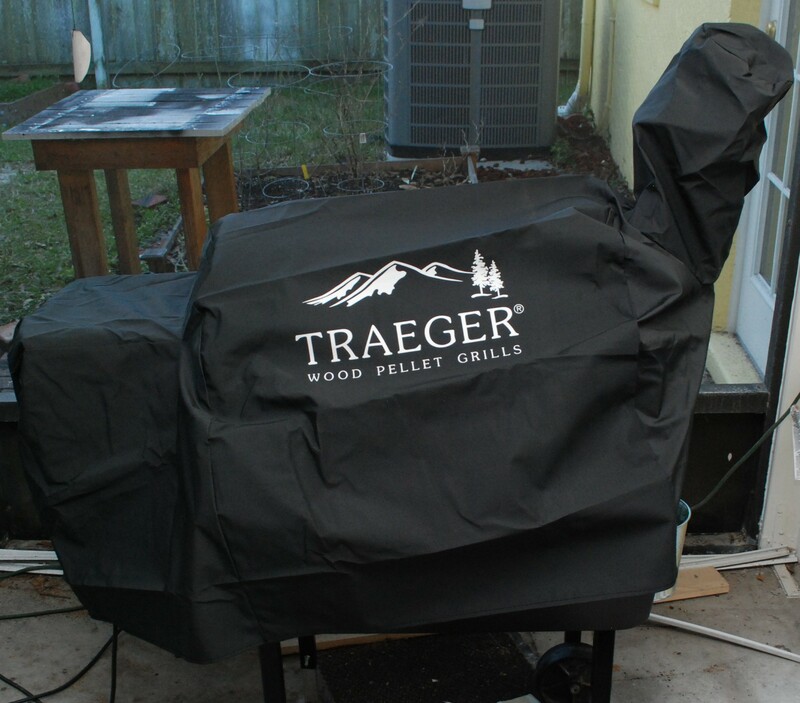 I bought a traeger pellet fed smoker in the summer of 2009, and have done mountains of delicious meat in it ever since. All those years outside in florida have taken their toll. The paint has faded and is rusting through in places, the outside is quite dirty, and a back leg has completely rusted through. I had to prop it up to keep the thing from rocking. The inside doesn’t look much better. Surface rust is kind of unavoidable, but neglect had built up on the walls and in the bottom tub. I should really clean this thing out more. My bad behavior aside, this thing is built like a tank. Even with all the years of outdoor use, I was able to pull all the screws out. There is a lot of surface rust, but nothing too deep except for the one back leg. 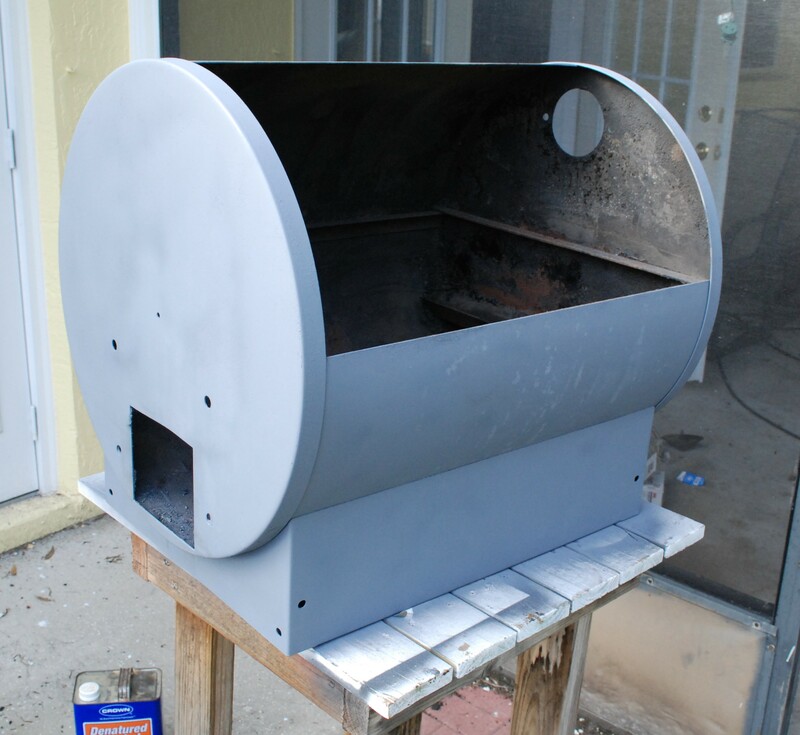 I started to take everything apart and became even more enamored with my smoker’s build and design. With all the parts pulled out and the mess cleaned up it was time to get everything back into shape. I used a wire brush on my angle grinder to strip all the bad paint and rust. 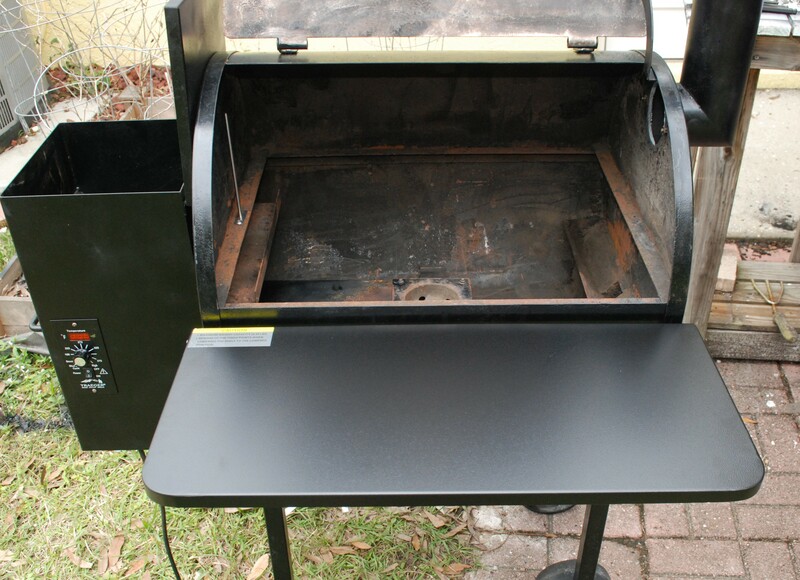 I started everything with flat black rustoleum grill paint. It covered everything but looked kind of bad. I was in the hardware store and noticed they have a semigloss. It matches the original paint job. I redid most of the parts with a primer, and gave everything another coat with the semi-gloss. Once all the paint was down I started rebuilding. Some of the hardware got replaced, but most of it was actually in really good shape. The back leg was shortened and fitted with an aluminum extension. No more rusting off foot! I replaced the hot rod starter because it is hard to get to and didn’t cost much to replace. Other upgrades happened along the way. They have a nice shelf that bolts in with the legs. 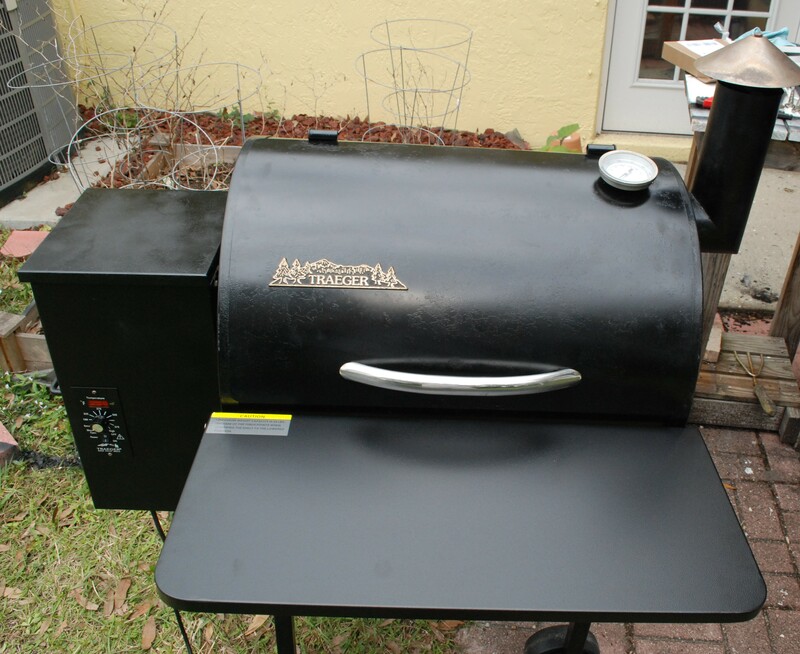 It folds away when not in use, and sits nicely in line with the entrance so you can transfer to and from the smoker. I pulled out the old controller that only had 3 heat settings. The new one reads the internal temperature and feeds in pellets accordingly. It has an autostart-up feature and a shutdown cycle that helps prevent soot. I also replaced the drip bucket because it was pretty nasty. All in all it looks pretty good. Because I couldn’t get all the old paint off there is some odd texture, but it looks way better than when I started. Now that I have the primer and grill paint around I will make it a point to check every year or so for bad spots that need a touchup. Lastly, the accessory I should have bought when I first got the grill. A cover! I don’t know how much longer the paint would have lasted with one, but it is worth a shot. 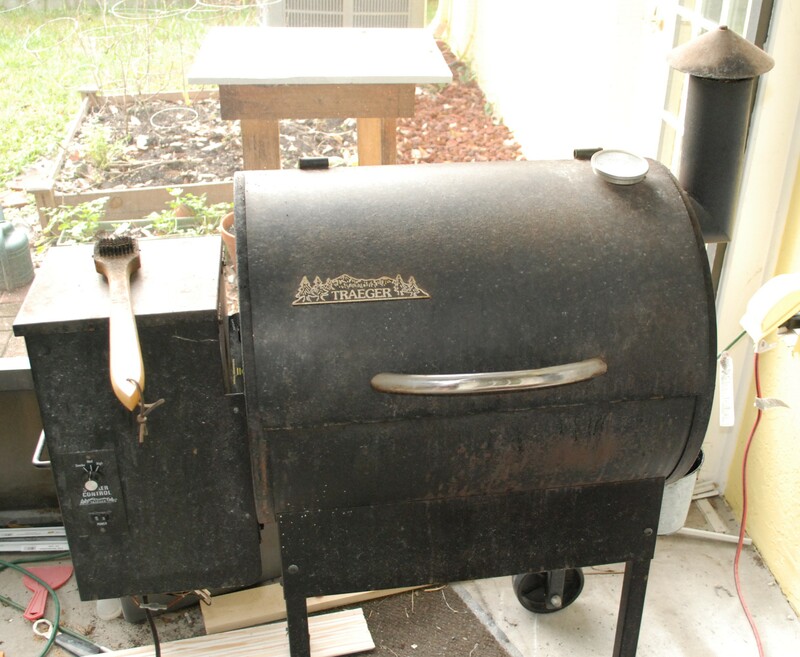 This smoker rocks. With a little more preventative maintenance than I had been doing I can hopefully look forward to another 6+ years of service. Delicious smoked meat posts to follow!